The second fashion week of the month. 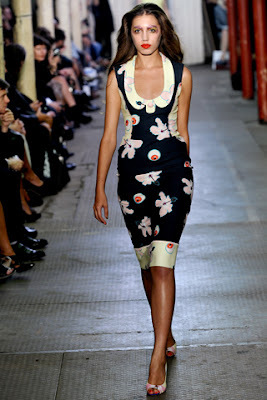 London fashion week kicked off to a powerful start, after New York fashion week came to a delightful conclusion. I envy every single person who was/is able to attend any of the fashion weeks... Great news arose today anyways, I am volunteering to work for Dublin Fashion Week aka. Dublin's Festival of Fashion this weekend. I shall be running around with clothes and God know's what for hours on end from Friday to Sunday, but I know that I'll love every minute of it. I'll take pictures and scribble down bits and bobs to share with you guys as usual, I'm trés excited! Back to London, this season was beyond imaginable, with every type of trend and style floating around.. it won't disappoint, enjoy! Christopher Bailey didn't manage to let us fashionistas down with his new, vibrant collection for Burberry Prorsum. I've always had a soft spot for Burberry Prorsum, the collections are always so glamourous, yet rocky and edgy. Much like my style. 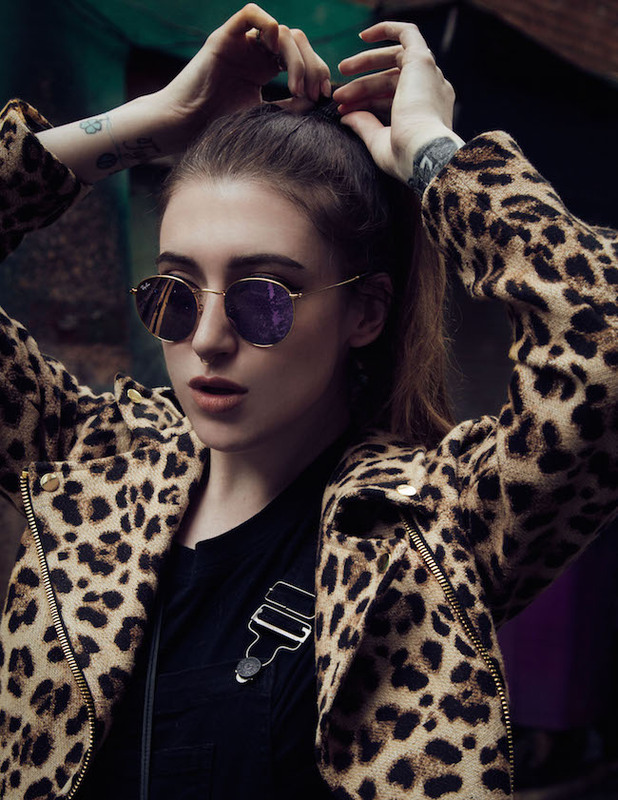 This collection is one of my favourites, the studded leather jackets and leopard print dresses had me at hello. The flush of aqua waist belts, contrasted perfectly with the revamped classic trench - cropped or black and camel coloured, the trench was out in all it's beauty and was given a youthful, modern twist. Christopher Bailey has London style down to a T, this collection screams London and youth and it glorifies it. Growing up with ballet will always have a life long effect on me, whether it comes down to posture, dance, Tchaicovsky or costume - it will always have a place in my jam-packed heart! 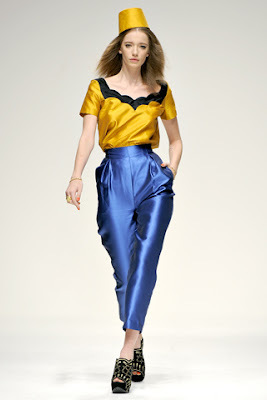 When I was looking at David Koma's collection I was of course in love right away. The ballerina theme carried it's way gracefully throughout the show, with a drop here and there of embelleshment and exotic golds. The pale pink flaring high-waist skirts did it for me mind you, I don't just need one, I crave one. Another designer who got a flick of the ballerina spell this season was Erdem Moralioglu. Erdem's ballerina, almost oriental, inspired collection is one of my favourites by far. Delicate white lace embroidered with blood red flowers, Alice in Wonderland tea party dresses given a original floral print and primary colours clashing and combining all over.. it was a lively, and without a doubt incredible collection. My love for Erdem has grown. 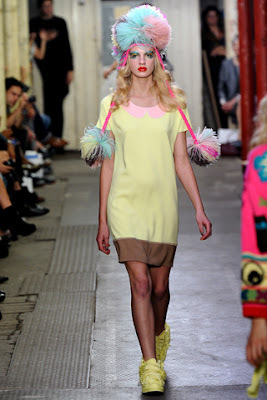 Giles Deacon's fun and quirky collection caused mixed reactions, people either love it or hate it. I love it! Pac-man prints, polka-dots, colours everywhere and crazy oversized bobble hats? Amazing! People never really look at the details here, they see an outfit on the catwalk and say ''No I don't like it.'' Yes, you may not like the outfit but is it possible you like individual pieces of the outfit? Giles mixes up his patterns and prints, and it works. If people aren't as bold as to wear an owl print jumper with a polka-dot dress, then why not wear either with a pair of jeans, a patent pair of Mary-Janes? The 50s and 80s are obvious eras that come to mind while looking at this collection, with the cat eye sunglasses and neon colours, but Giles insists it's actually inspired by the 90s. Ho Hum. With a fez as the headgear of choice and nearly every pattern under the sun on display, PPQ showcased one of their best collections yet! Theatrical mixed in with laid-back lady, with delicious colours used together, an exciting and eclectic parade of clothes and accessories were created.. fabulous! I'm always a bit apprehensive with celebrities' fashion collections, but Savannah and Sienna Miller's Twenty8Twelve collection was beautiful this season. It really surprised me to be honest, as I see both of them as quite boho-festival girls. They had elements of their tastes in the collections of course but they explored other areas like the 'Girl Next Door' dresses and feminine colour schemes. A really fresh and casual collection, simple to wear and I adore the patterned dresses and layered skirts especially. London didn't fail to amaze people this season, with ballerina and 90s trends, stripes and pac-man.. these upcoming Winter months will somehow not seem as a gloomy with this magnificent inspiration on the catwalks for the high street stores, oh I wish upon the day I can afford to go out and buy an Erdem dress..